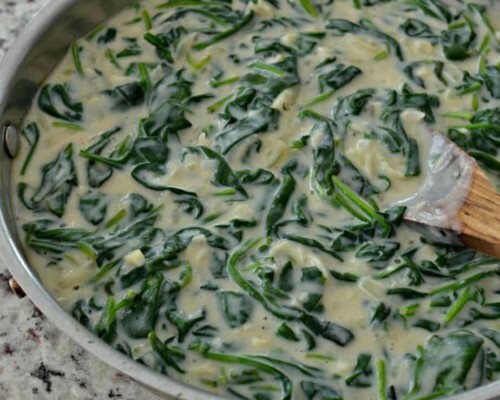 This made from scratch creamed spinach is one of my favorite sides. Serve it over rice, noodles, baked potatoes or grits. Melt butter in large skillet over medium heat. Sprinkle flour over the the melted butter and whisk in. Continue cooking and whisking over the heat until the mixture turns a light brown; approximately 7 minutes. Slowly whisk in milk, nutmeg and onion powder. Salt and pepper to taste. Simmer over low heat and stir frequently. Heat 1 tablespoon of olive oil in extra large skillet over medium heat. Add onion and cook for 3-4 minutes. Add garlic and cook 1 additional minute. Remove to skillet with cream sauce. Heat 1 tablespoon of olive oil in same skillet over medium heat. Pile in the spinach and cook until wilted; approximately 2-3 minutes. Remove to skillet with cream sauce. Repeat with remaining spinach working in batches that are appropriate for your skillet size. If desired season with more salt and pepper to taste and serve promptly. If desired add 2 pinches cayenne pepper or 2 pinches crushed red pepper for a little heat. Add this at the same time as the nutmeg and onion powder.